Serious Reiki research based on testing and verification. 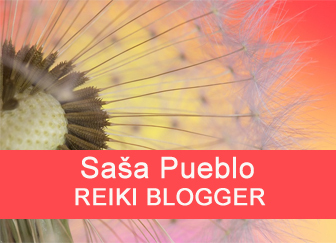 Getting know different Reiki systems. This time we will deal with Chinese system Tai Chi and insert Tai Chi to Reiki system. Tai Chi is a shamanic system of tree cult. 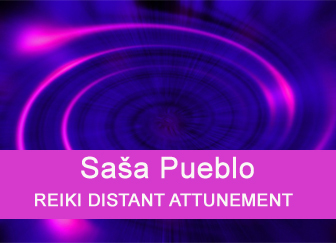 Sasha Pueblo has been trying to enter Chinese spiritual world many years. He studied and processed Tao issues. This way of thinking is inspired by shamanic tree. He also studied forbidden city in China. He has watched series of videos about forbidden city, its rituals and ceremonies how Chinese rulers were located into the world of dead memories. I watched a lot of Chinese videos where mainly rituals around cut tree were performed. There were also videos of Chinese deities, lots of videos about Chinese dynasties and their history. He has seen many videos about Chinese artifacts and Chinese art. He has studied Chinese acupuncture and its history. He talked to specialists who studied acupuncture in China. He practiced acupuncture. He was getting knowledge about alternative treatment in China. He trained both Taichi and Chikung and continues to practice these exercises. He got to know Chinese pyramids and other iconic buildings. He got to know legends about flying dragons. He is still practicing clairvoyance techniques of the animal zodiac. He studied Chinese pictograms and Chinese character script. He worked with luopan as great device for practicing clairvoyance techniques. This was an excellent system of knowledge of China, its traditions and esoteric spirituality. He revived forgotten Taintai School and practiced Reiki Taintai. He returned a new life to this Chinese Reiki from the desert of Gobi. 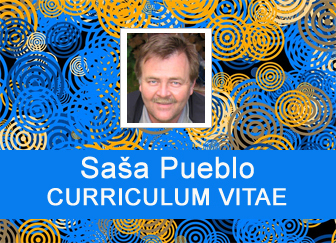 Sasa Pueblo is a nature and tree enthusiast. He studied timber and horticulture and was always close to the trees, to germans runes from twigs. He loved and practiced rituals around trees in nature. He planted hundreds of trees. He harvested roots, the bark, flowers and fruits of trees and he was healing himself and others. He has loved growth rings and until nowdays still oracularly perceive growth rings of tree. He reads their good and bad times. Someone made a print of growth ring and put it in a gramophone as a record and made a sound record. He likes different kinds of wood sculptures created by a chainsaw. He loves to watch how they build abodes of immense beauty and prosperity from the huge trees. He admires the largest and oldest trees all over the world. Excellent foundation for healing powers derived from trees. He visited deep Russian forests and gained his own experience from the Russian taiga. He received extraordinary attunement from indigenous shamans. He was involved in grafting of trees which was an excellent basis for understanding yin and yang symbol. He even developed the technique of attunement to both Reiki and living trees and restored the ancient Chinese tradition of dedicating the tree for deep treatments and meditation. 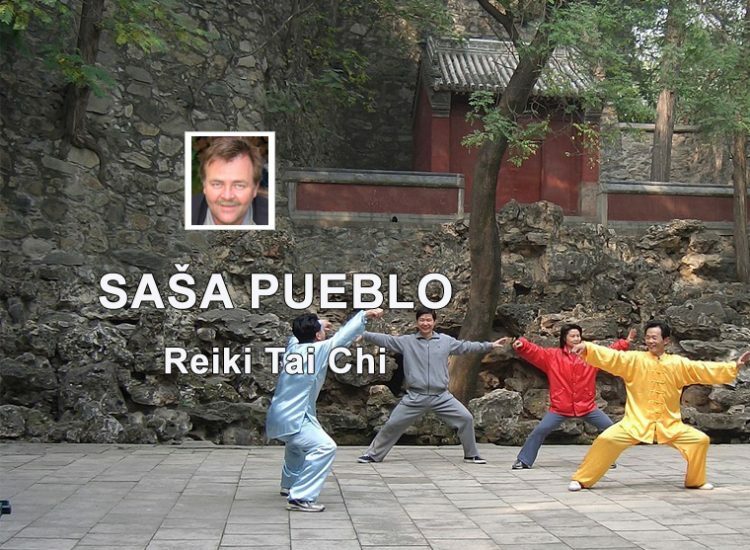 Sasa Pueblo meets chinese Tai – chi master. He receives attunement to spiritual chinese esoterism. He learns how to lower the activity of big brain and also the activity of the spinal cord and abdominal brain. It induces a meditation state similar to that of celebral palsy in the brain and in the body. Master Tai – chi puts him in the position of a person in the 80th year of life, where the body is driven exclusively by small ganglia and cells by reason of the old age. And that is the real path to the deep Chinese art of opening and penetrating into the own body cells. And his master teaches him one of the greatest mysteries and the fact that human cells are extremely close to tree cells and not animals. And then it all started, and the energy from the surrounding and distant trees began to flow through Sasa Pueblo. 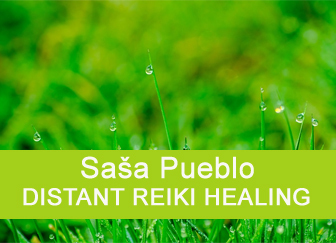 Sasa Pueblo leaves medical imaginations about human and animal cells and accepts more wisdom. And this is the basis for opening the flow of energy from beneath your bone to bones and the whole body. Sasa Pueblo remembers how he nearly a year practiced exercises into bones and sucked up the energy of trees. But he did not know about that. Now, Sasa Pueblo has opened Shaman cult of a tree that the Chinese brought from their homeland in Siberia, from where they had to migrate to the territory of today’s China. Master Tai Chi who wants to remain unnoticed, gives him the secret of yin-yang. They are actually two accrete trees along the whole length of the tribes. Sasa Pueblo remembers trees and the strength of this connection. Intuitively he feels how cells of their bodies should be organized to kind of small embryos and with the help of the energy from trees, they can again breathe new strength and vitality. And what the master did not give him, he took it and he will use this for all who want to practice Reiki Tai – chi. He will be glad when Reiki Tai – chi becomes part of large Reiki family all over the world. It also works in the top form and penetration of trees into parts of the brain. 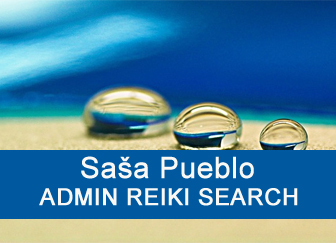 The adoption of shamanic tradition through Tai Chi allows Sasa Pueblo to fully practice Pranic Reiki. Tao te ching, roughly translated as Tao and the Book of Path (Tao) and its power (Te), is the basic book of Taoism. Its legacy is attributed to legendary old master (Lao-c), who reportedly wrote it around 600 BC. The word Ťing means “sacred book”, “moral canon” (Buddhists later used the term “sutra”). In this category you will find a set of all in wikipedia at the level of the article processed higher plants that can take forms of the tree, including those that often or more often grow as shrubs. The Yin and Yang concept originates in ancient Chinese philosophy and describes two opposite and complementary forces that exist in every living and non-living part of the universe. Wrinkling is, together with vaccination a method of deliberately vegetative propagation of crop plants commonly used in gardening practice for the maintenance and reproduction of plant cultivars that have beneficial properties for the breeders, genes. Growth ring is the increment of wood created by the kambiom during one vegetation period. One year cycle corresponds to one vegetation period. Depending on the number of rings, the approximate age of the tree can be determined. We also getting know where is south or north. Tai chi is a mark for Chinese martial arts which is currently being developed by many as exercise for health and improving the quality of life. Prana is life energy, universal life force, absolute energy. In Chinese-Japanese tradition of chi or ki. It represents all forms of energy and manifests itself in different areas of existence at different frequencies. Pranayama is control of mind activities by turning sensory organs inside. This means that the mind is controlled without sensory organs (after they´ve being excluded). Wherever your mind falls, try to control it and get it back. Return your mind back whenever it is influenced by a pleasant scent or an unpleasant odor; try to keep it under your control. Qi-kung is generally perceived as traditional Chinese exercises that cultivate qi or “vital energy”. In addition to developing the physical body, qi-kung also deals with the development of the mind. Qigong is a training based on holistic life theories, which requires the participant to knowingly use the thought intention to focus inward on transformation, improvement and better life functions. This is training that enables participants to transform natural instinctive activities into conscious activities. Primordial Qigong is Qigong form developed by the Taoist sage Chang San Feng. The original qigong system reflects the Taoist theory of the birth of the universe. These concepts were based on their observation of nature, their perception of the alternative energy balance of primary forces (yin yang) and the integral relationship between heaven, humanity and the earth.